Hi there album fans. Displaying records in my window has caused me to notice some curious items over the years. I love the creativity and the brilliantly original ideas some record labels come up with. Sometimes an album comes through that seems strikingly familiar and I'll swear the album has a twin. Here are some albums that had me seeing double. Marilyn Manson - "Smells Like Children"
Well my dear readers, Mr. Manson's face is nice and green - just like all the cash he made off this record. Anyway, all the kids eat this "cutting edge" stuff up. 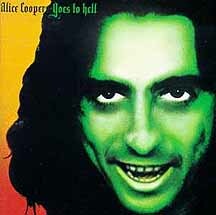 It seems I remember Mr. Alice Cooper did the same cover in 1976 on "Alice Cooper Goes To Hell" - green face and all. At least Marilyn chose a more masculine name than Alice. 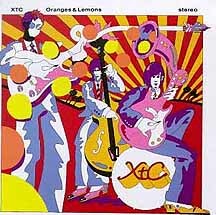 XTC - "Oranges And Lemons"
What a groovy cover! Wait a minute. This stirs my mannequin memory banks too. 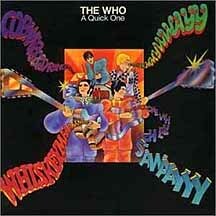 I really dug The Who's "A Quick One" too. Is XTC really the Who or is The Who really the Dukes of Stratosphere?